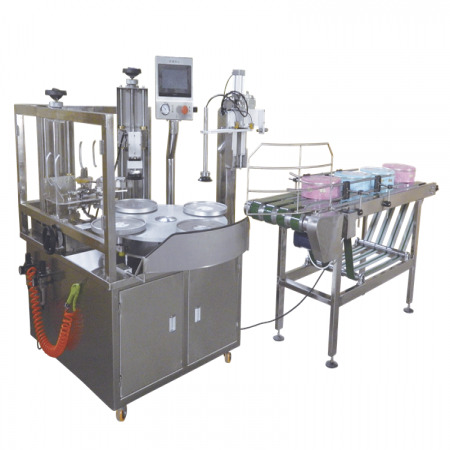 Machine use for sealing various type of adhesive tape around containers. Adopt with XYZ parameter setting devices to suit various shapes and height of container (eg: round, square, rectangular, oval & etc). An automatic tape dispenser sticks the tape on the container and cuts at any desire over lapping length. Container holders are attach onto an intermittent turn table. This turn table is driven by heavy duty and high quality Indexing Drive which is imported from Taiwan. Containers are manually place into the holder and the turn table will intermittently turn to the process of tape sealing, picking up and place onto the take away conveyor. Advanced design with PLC control system and reasonable mechanism design to make the equipment for simple operation, stable performance and high production efficiency.